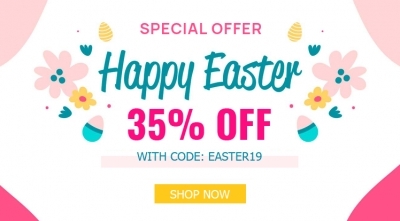 To celebrate Easter Day and Labour Day 2019, SmartAddons would like to bring you an exciting offer with 35% OFF on any purchase on SmartAddons store including Joomla Templates, OpenCart Themes and Shopify Themes as well as Member Clubs and Renewals. 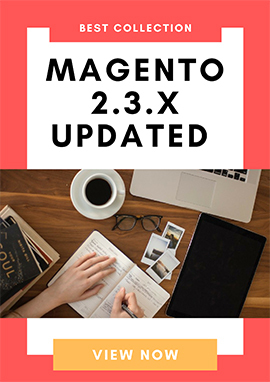 The special offer is valid from April 20th to April 30th, 2019. So don't miss out! 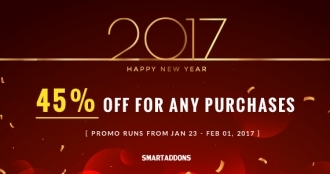 SmartAddons is taking part in this Black Friday with an exciting offer on any purchase. Get 35% discount on any Joomla and OpenCart Themes and Member Clubs. This is a limited time offer, so don't miss it out! SmartAddons is celebrating this Halloween with a big sale on any purchase. 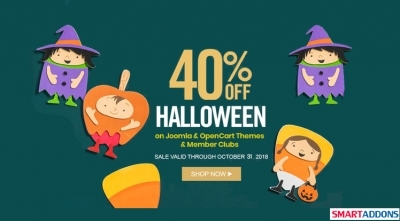 Get 40% discount on any Joomla and OpenCart Themes and Member Clubs. This is a limited time offer, so don't miss it out! SmartAddons Policy Update: FREE Quickstart Installation Service. See more. On this Children's Day, let's celebrate the joys of childhood and have a fantastic time together! To celebrate Children's Day 2018, SmartAddons would like to give you 30% OFF on everything on SmartAddons store including single purchase and Joomla subscriptions. Of course, the discount is applied to SA membership renewals as well. The special offer is valid from May 29th to June 04th, 2018. So don't miss out! 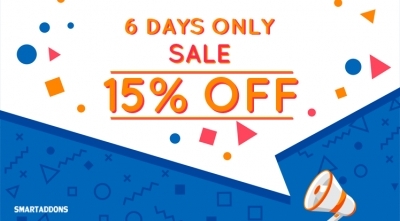 To celebrate the April template release - Sj PiStore, SmartAddons would like to give you an exciting offer with 15% OFF on everything on SmartAddons store including single purchase and Joomla subscriptions. Of course, the discount is applied to SA membership renewals as well. The special offer is valid from April 17th to April 22nd, 2018. So don't miss out! 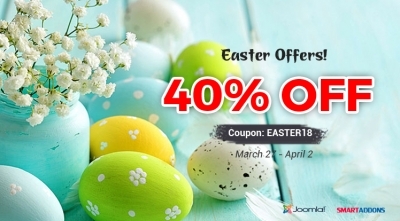 To celebrate Easter 2018, SmartAddons would like to give you an exciting offer with 40% OFF on everything on SmartAddons store including single purchase and Joomla subscriptions. Of course, the discount is applied to SA membership renewals as well. The special offer is valid from March 27th to April 02nd, 2018. So don't miss out! Happy International Women's Day 2018! 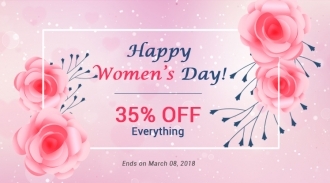 SmartAddons are happy to give you an exciting offer with 35% OFF on everything on SmartAddons store including single purchase and Joomla memberships. Of course, the discount is applied to SA membership renewals as well. The special offer is valid for 3 days only. It starts from March 6th to March 8th. So don't miss out! The Year of the Rooster is all around the corner! We're so excited to celebrate this special holiday with a rocking offer with 45% OFF on all Joomla products purchasing, membership plans and renewals. At SmartAddons, you're guaranteed to be served the best Joomla templates and extensions to build any kind of websites. This offer is available from January 23rd to February 1st 2017! So don't miss out this great chance.